Over the past few weeks, I have been sharing salad in a jar recipes here. This is the third post in that series. I am really in love with the salad in a jar idea because it allows me to make the salads on the weekend and have ready-made lunches that I can grab at least through Wednesday. This ensures that I will eat a fresh, healthy and economical lunch at work and helps to prevent spending money on take-out. In addition to being a great lunch, these salads can also be a quick and easy dinner idea as well. For instance, this taco salad would make a great accompaniment for some quesadillas. Quesadillas come together quickly, and I don’t feel guilty because I didn’t make a well balanced meal. The salad is chock full of vitamins and minerals from the veggies. 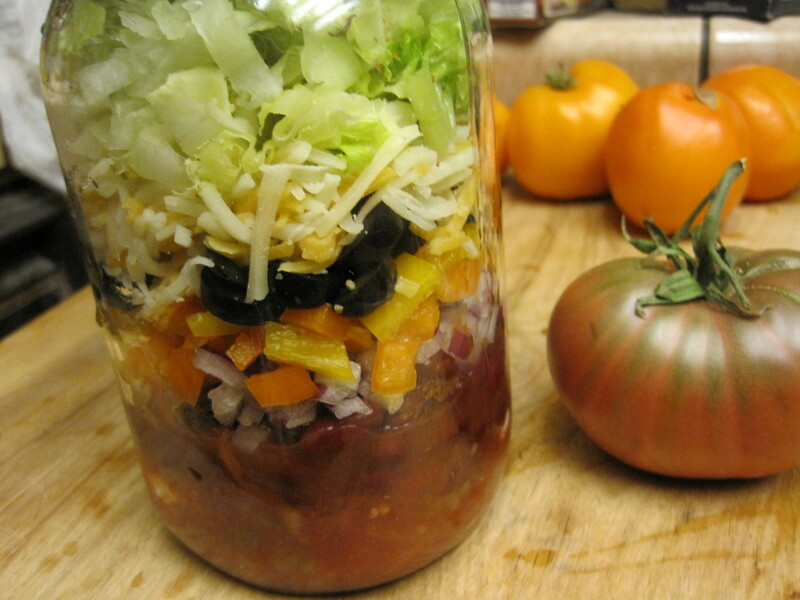 One caution about making salads in a jar, or any salad, is that you must follow certain guidelines for building a healthy salad or the salad will not necessarily be healthy. It’s really easy to pile high calorie items onto your salad. You must be careful so that your salad doesn’t end up containing more calories than a typical fast food meal. That defeats the whole purpose of eating a salad. To make this taco salad, I opted to go vegetarian. There used to be a restaurant on the second level of the Santa Maria Town Center Mall. My friend Molly and I used to go there for lunch and share a taco salad. There was no meat in the taco salad, but it was delicious. It has been years since I have eaten that salad, but I tried to picture it in my mind. Mostly, I pictured all the things we got on the side because Molly didn’t like them on her salad, but I did. It was always a very filling lunch. I washed and dried my widemouth quart-sized mason jars and set them aside. 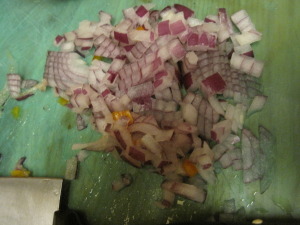 Then I began prepping all of the ingredients. 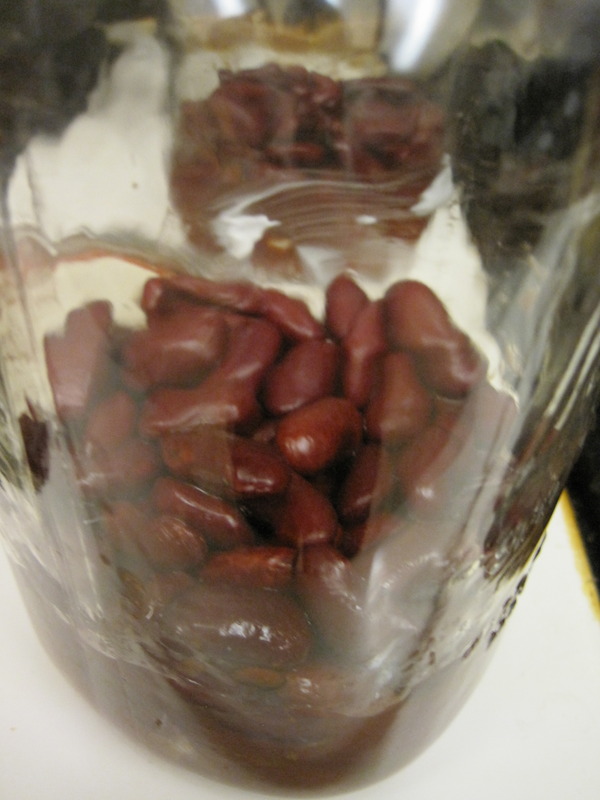 I washed and chopped up lettuce, I drained a (2.25 ounce) can of sliced black olives and a can of kidney beans. I also rinsed the kidney beans. I chopped orange and yellow bell peppers. 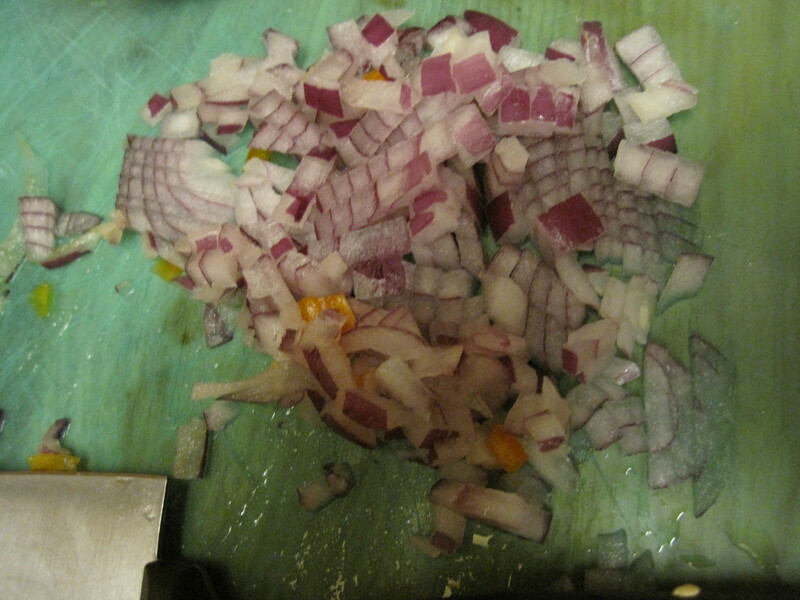 Actually, you can tell by the residue on my cutting board that I did the peppers first and then the onions, but it doesn’t really matter. The point is that I chopped up everything I needed beforehand. 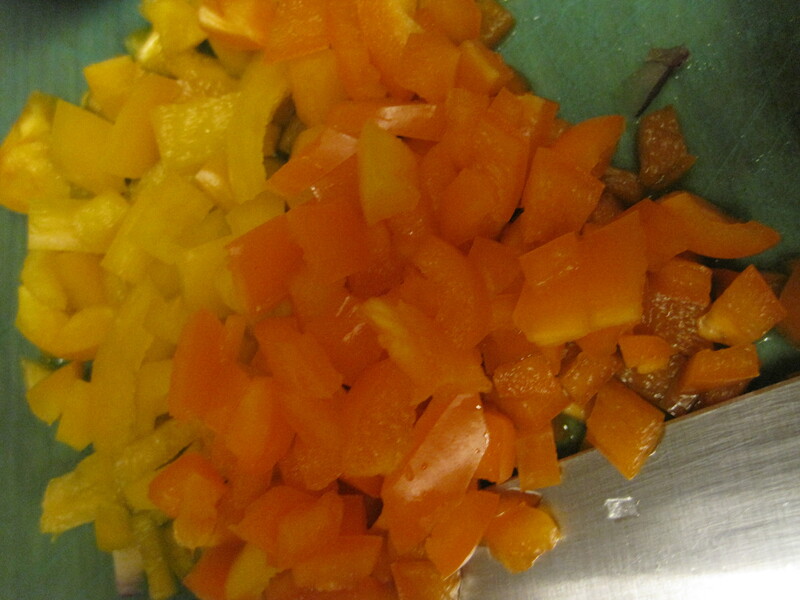 The assembly is fast and easy once the vegetables are prepared in advance. I assembled two of these at one time. First 1/2 cup of jarred salsa was placed in the bottom of the jar. Fresh salsa does not hold up well for this application. A dollop of sour cream was placed into the salsa. I had intended to mix them together and make a creamy salad dressing, but I forgot. It still worked out okay in spite of this oversight. Calorie conscious people can opt to use fat-free or reduced fat sour cream. In this instance, no one really notices. Next, I put half of the kidney beans into the salsa. Kidney beans went first because they can tolerate sitting in the salsa without losing their texture. Next, the onions and bell peppers were layered into the jar. This was topped with the well-drained olives and shredded cheese. The rest of the jar is then filled with chopped or shredded lettuce. I prefer romaine lettuce because it holds up better than the other lettuces. I made two, quart-sized salads, but this recipe could easily make 4 pints. Keep in mind that you may need to shred a little extra lettuce in order to fill up your jars. I usually pack a side of tortilla chips to eat with the salad. I like to line the edges of a plate with them before pouring out my salad. Baker’s Man likes to sprinkle his on top like croutons. Either way, it’s delicious. Give it a try and let me know what you think. Taco salad makes a delicious lunch. This vegetarian version is layerd in a mason jar and makes a great make ahead lunch. Layer ingredients, except for tortilla chips. 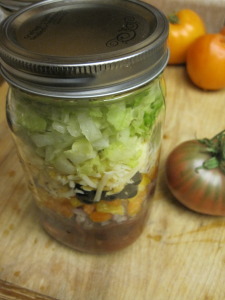 into two, quart sized, or four ,pint sized, wide mouth mason jars in the order listed above finishing off with lettuce. 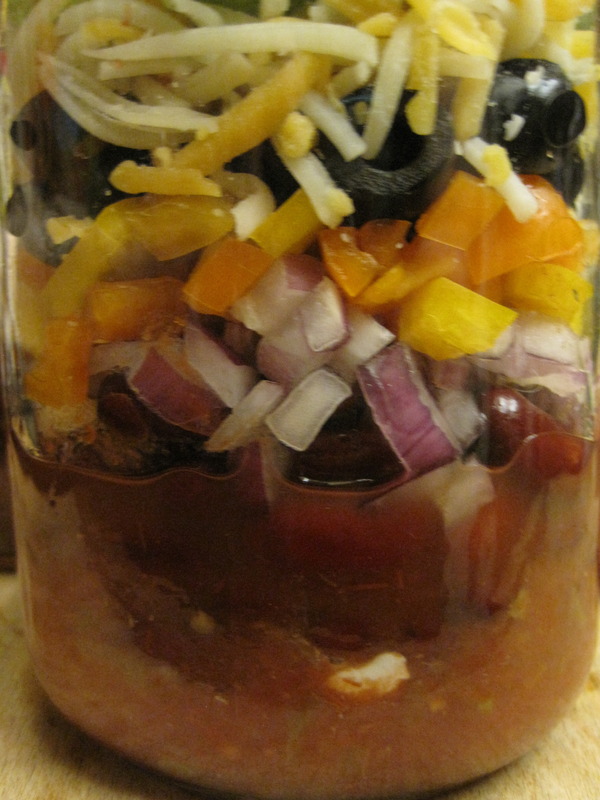 Place lids onto jars and store in the refrigerator. until ready to serve. I usually pack the tortilla chips in a separate bag and either put them on the plate/bowl before adding the salad or sprinkle them on top.